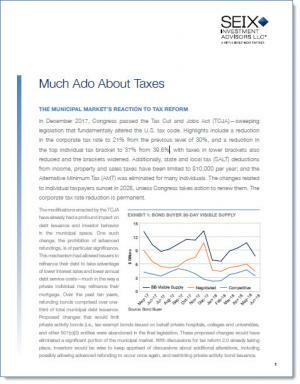 In December 2017, Congress passed the Tax Cut and Jobs Act (TCJA)—sweeping legislation that fundamentally altered the U.S. tax code. Highlights include a reduction in the corporate tax rate to 21% from the previous level of 30%, and a reduction in the top individual tax bracket to 37% from 39.6%, with taxes in lower brackets also reduced and the brackets widened. Additionally, state and local tax (SALT) deductions from income, property and sales taxes have been limited to $10,000 per year; and the Alternative Minimum Tax (AMT) was eliminated for many individuals. The changes related to individual taxpayers sunset in 2026, unless Congress takes action to renew them. The corporate tax rate reduction is permanent.